Our new Dehumidifier Testing Chamber. Jon-Don, a leading national distributor of supplies, equipment, and training to professional contractors and in-house service providers in the disaster restoration, carpet and flooring maintenance, janitorial, and concrete surface prep and polishing segments, has announced that all of its repair centers now feature on-site dehumidifier testing chambers. These testing chambers allow service technicians to dial in specific temperature and humidity levels for accurate testing and diagnosis. Most service and repair centers are only able to test dehumidifier performance at current workshop temperatures and humidity levels. During the winter months, when it is cold and very dry, accurately diagnosing a problem can be very difficult. Jon-Don’s repair centers, however, can duplicate the exact situation in which the dehumidifier is malfunctioning. 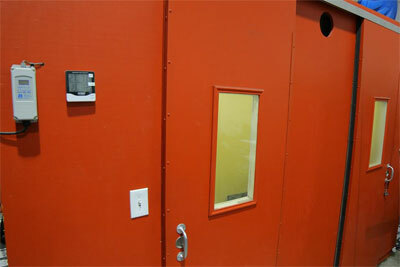 Jon-Don is one of the only distributors with these on-site testing chambers. It’s also one of the only ones to employ factory-trained technicians certified in refrigeration repair, giving them unique expertise in the field of dehumidifier maintenance and repair. Jon-Don’s service technicians can perform both major repairs and routine preventative maintenance on all makes and models of dehumidifiers. Preventative maintenance includes detailed cleaning of coil assemblies and cooling fins, complete cleaning of the purge system, and thorough testing for optimal operation according to manufacturer guidelines. Customers interested in do-it-yourself repairs can also call Jon-Don for free technical advice over the phone. Visit our Repair Center for more information on repair services at Jon-Don or to find a local repair center near you. You can also call 800-556-6366 to speak with a Jon-Don representative.